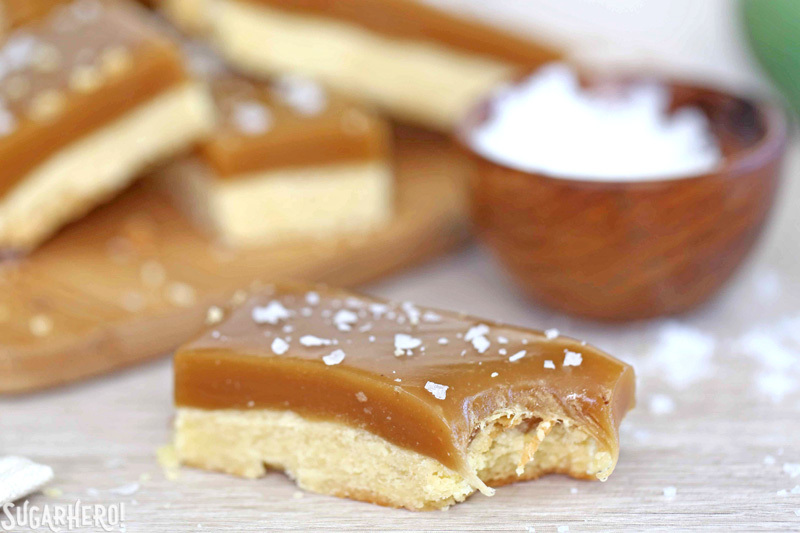 Salted Caramel Bars have a buttery shortbread base and a topping of rich, chewy caramel. A crunchy dusting of flaked sea salt on top is the perfect finishing touch! I can’t believe I’m saying this, but today I am sharing a recipe where I intentionally resisted adding extra chocolate. I KNOW. I’m shocked too! 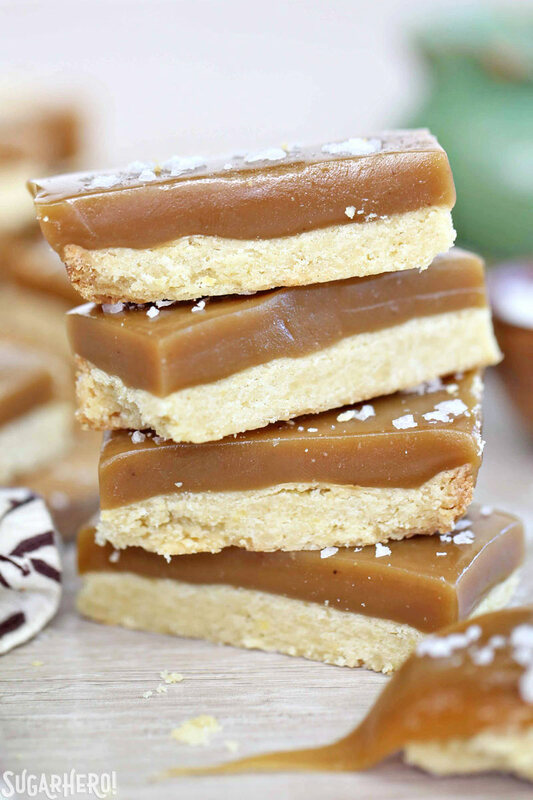 But these Salted Caramel Bars, although they would be delicious with chocolate, are also just as dreamy without it. And that’s not something I say lightly! I’m a dedicated Twix candy bar lover, and these bars are sort of like a gourmet, naked Twix. (Soooo not really like a Twix at all, when it comes right down to it.) 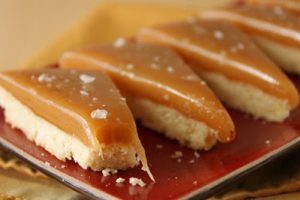 But they have the two basic components: buttery shortbread crust, rich and chewy caramel topping. But that’s where the similarities end! The crust and caramel are about equal in these bars, which is what I like. Too much crust and you just have a dry bar cookie, but too much caramel and you’re chompin away like a cow chewing cud and wishing you had some shortbread to cut the chewiness. 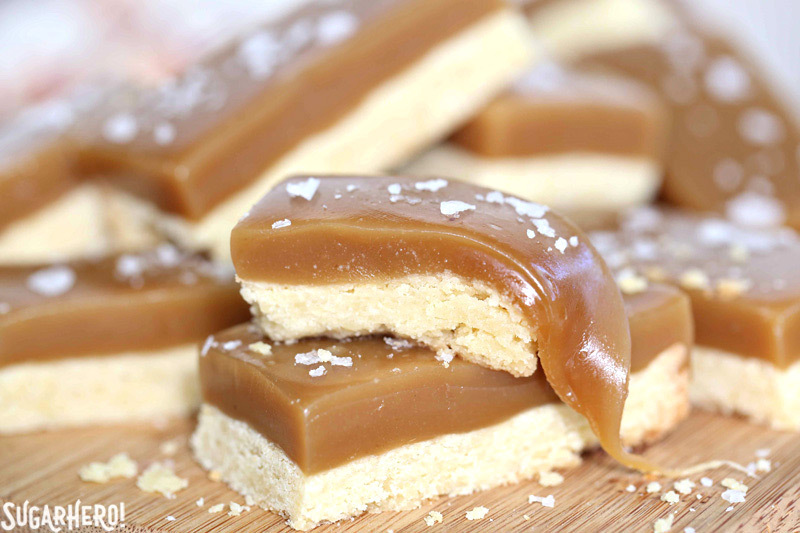 Solution: equal parts shortbread and caramel to balance everything out. The shortbread is SUPER easy. In fact, I used a fork to stir everything together and it was done in approximately 4.3663 seconds. Give or take. Then it’s baked until lightly golden and ready to receive a glorious caramel bath. The caramel is full of every good thing in this world: brown sugar, for a deep, rich taste, lots of butter because that’s what makes the world go round, and a bit of cream, too, to make them extra-luscious. I love the texture: it’s chewy without being sticky, and sweet without being cloying, thanks to the generous spoonful of salt in the recipe. 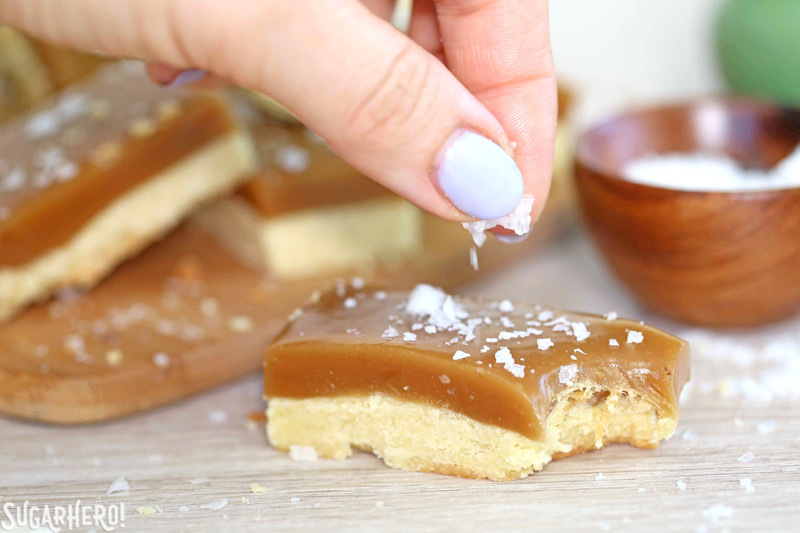 The best part, though, are the large sea salt flakes that are scattered on the bars just before serving, to add a crunch and a savory bite that perfectly contrasts with the caramel. As I mentioned, these bars definitely COULD handle some chocolate, if you want to go in that direction. I think a drizzle over the top or a partial dunking in melted chocolate would be perfect. They’re not hard–I hope the video up top gives you a sense of how simple they can be–but since they do involve cooking caramel and a candy thermometer, I just wanted to take a moment to troubleshoot some potential problems. 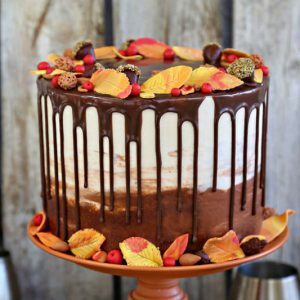 If you’re going to make these and haven’t worked much with cooking sugar, please take a moment to read through these tips–you might save yourself a bit of time and hassle that way. I highly (HIGHLY!) recommend using a candy thermometer. It doesn’t have to be an expensive or fancy one–even a basic $8 thermometer will get the job done. 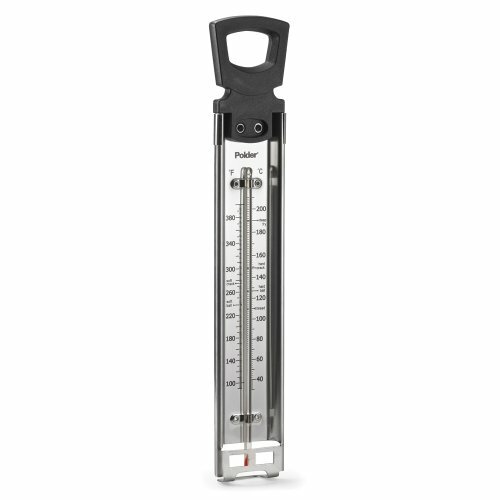 When you get that thermometer–test it before using it. Even if it’s new, there’s no guarantee it’s completely accurate, and you want to know what you’re working with. 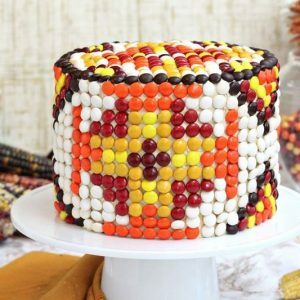 Additionally, your altitude might affect how the candy cooks, and a higher altitude can produce overcooked candy unless you’re careful. So testing your thermometer before you begin is a good way to make sure you don’t waste your time or precious ingredients. To test your thermometer, bring a pot of water to a rolling boil in the stove, and insert your candy thermometer. Leave it in there for several minutes, then check the temperature. Water boils at 212 F (at sea level). If your thermometer says 212 F, great! You are good to go! Make the recipe as written! If your thermometer does not say 212 F, it’s time to do a little math. Example: if your thermometer says 208 F, you know that it measures 4 degrees too cool, and you’ll want to take this into account when cooking your caramel. The recipe calls for cooking your caramel to 250 F, but your thermometer is 4 degrees off, so you will not go all the way to 250 F–only cook it to 246 F, because that is your personal thermometer adjustment. This is a test you should perform regularly because thermometers can become less accurate over time. For more information and examples, see this article I’ve written on The Spruce. 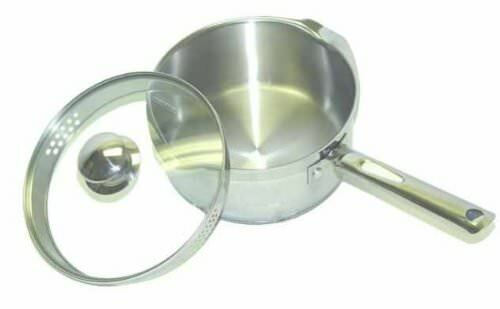 A heavy-bottomed saucepan is also recommended–thin saucepans usually have “hot spots” where the food cooks faster, and this can lead to burned or scorched candy. The heavier, the better for consistent results! Pre-heat the oven to 350 degrees Fahrenheit. 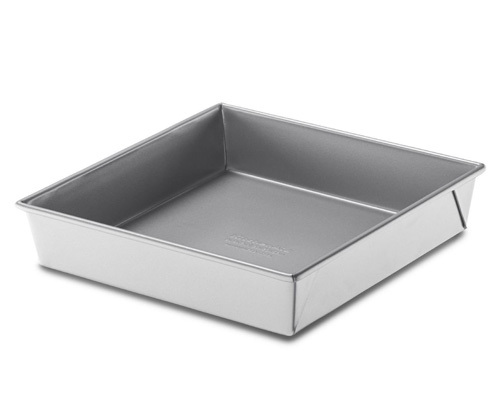 Prepare a 9-by-9-inch pan by lining the bottom with a long strip of parchment paper, making sure that the paper is long enough so the ends hang over the sides of the pan. Spray the parchment and pan with nonstick cooking spray. In a large bowl, stir together the sugar, salt, and melted butter with a fork. Add the egg yolk and mix well. Finally, add the flour and stir until the crust is moist clumps. Transfer the dough into the parchment lined pan and press down with your hands or the bottom of a measuring cup to make an even layer. Refrigerate the crust for 15-20 minutes, until chilled. Bake the crust for about 25 minutes, until lightly golden brown on top. Let the crust cool completely while you prepare the caramel topping. To make the caramel topping, combine the butter, brown sugar, corn syrup, salt, granulated sugar and cream in a medium heavy-bottomed saucepan. The caramel will bubble up as it cooks, so be sure to use a pan where the mixture can triple in size. 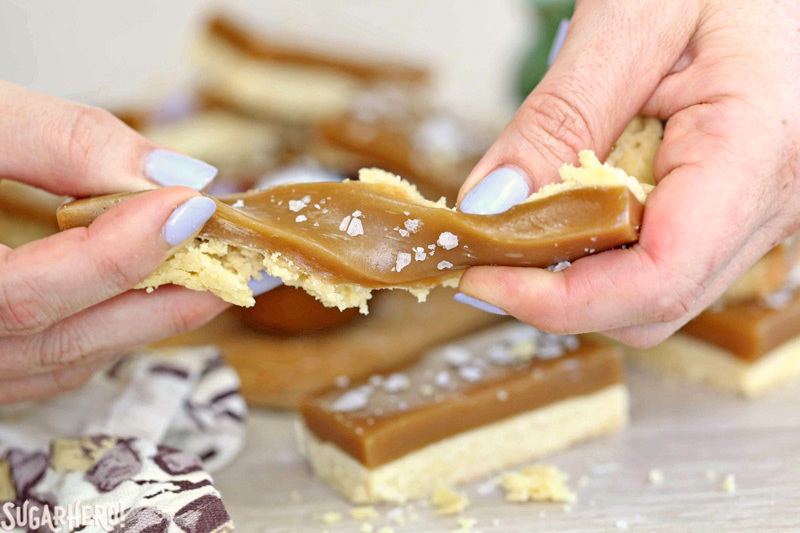 Once at the right temperature, remove the pan from the heat, stir in the vanilla extract, and pour the caramel on top of the shortbread. Let the caramel sit until firm: about 2-3 hours at room temperature. You can speed up the process by refrigerating it, but it will get very hard in the refrigerator, and you might need to let it come back to room temperature before cutting and serving. 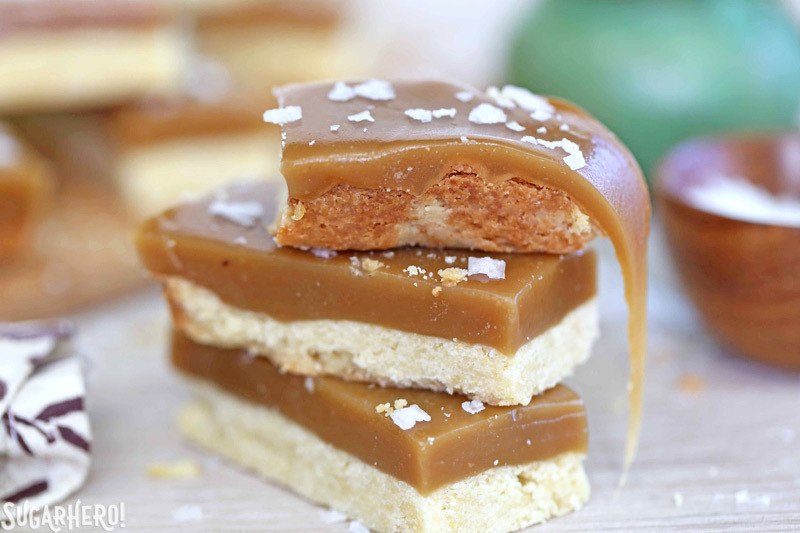 Once the caramel has set, remove the bars from the pan and cut it into small square or rectangles. Finish with a little pinch of flaked sea salt, and enjoy! These bars are best served and eaten at room temperature. 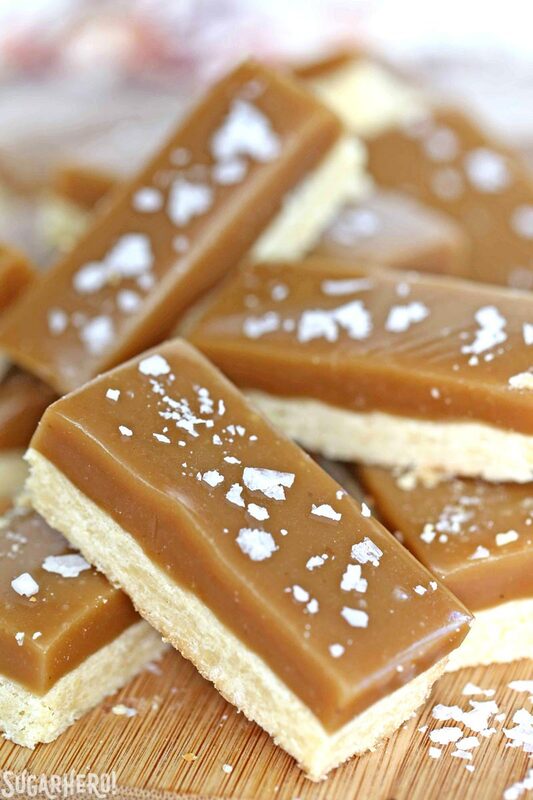 If you have cooked them a little too long and they're harder than you like, microwave them for 5-8 seconds and the caramel will soften to a wonderfully chewy texture. These look amazing – finally a recipe that will make me go out and buy a candy thermometer. Oh these look truly awesome!! I'm a salted caramel girl as much as I'm a chocolate girl. Maybe you could dunk these entirely into melted chocolate ala Twix? I just made these. Super EASY and Super YUMMY. I had never made caramel before and it came out perfectly. Yum! What a perfect addition! I’m glad you liked it!! I live at about 7,000 feet altitude. I tried making toffee last Christmas and it was a disaster, and don’t know if it had anything to do with failure. I c So, I’m tentative to make caramel. Any tips? Hey Kathleen, its a 9-by-9-inch pan. Thanks so much! 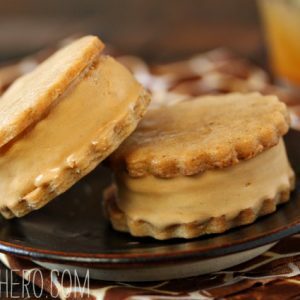 I am a huge salted caramel fan, so this recipe caught my eye — and these just became my new favorite cookie! 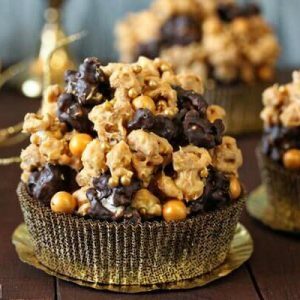 I made them for Christmas and they are absolutely delicious! My only misstep was not boiling the caramel QUITE enough. I like a slightly softer chew, so I took it to 245, using my candy thermometer. It set up great — but after I cut the bars and put them on a plate at room temperature the caramel melted off (not entirely — there was enough left on and they remained very tasty). I had to refrigerate them to keep them firm enough to eat. Next time I will boil to the full 250. Otherwise, they were a hit. Hey Jane, I am happy to hear it worked out. I appreciate the feedback. Thanks so much! These were good but I will make some adjustments before making them again. I found the shortbread to be very crumbly making for messy and not so easy to cut bars. Next time I will make a different shortbread recipe. The caramel is great but I wish I had cooked it less, maybe 240 or less. Mine was way too firm cooked to 250. Hey Amber, thank you for your feedback. Once you make those tweaks I would love to hear how they turn out and how that goes. Thanks again!